Research in endothelial cell adhesion to Prosthetic vascular graft materials. John C. Dali, M.D., FACS is a board-certified general and vascular surgeon at White-Wilson Medical Center in Fort Walton Beach. He specializes in full-service General and Vascular Surgery, and is trained in the latest minimally invasive techniques, including the nearly scarless single port robotic gallbladder surgery. Dr. John Dali earned his medical doctor degree from New York Medical College in New York, NY, in 1996. After graduating, he went on to complete his residency at New York Medical College at St. Vincent's Hospital & Medical Center in New York, NY, in 2001, and has been practicing on the Emerald Coast ever since. Dr. Dali was elected as Honorary Commander of the 33rd Fighter Wing at Eglin Air Force Base in 2015, which was a tremendous honor for him. Dr. Dali is a second-generation general surgeon. His father served as chief of surgery at Eglin AFB before opening his private practice on the Emerald Coast. Dr. Dali was proud to follow in his father's footsteps and had the opportunity to work in private practice with him for six years before joining White-Wilson Medical Center. Dr. Dali believes in treating patients like he would treat a family member, recognizing that surgery is a sensitive matter. 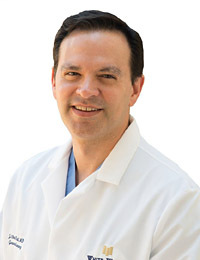 He is committed to consistently providing quality care and staying abreast of current technology and techniques, including minimally invasive procedures and advanced vascular therapies. In addition to offering the latest techniques, such as single site robotic gallbladder surgery, Dr. Dali offers in-office therapies to treat varicose veins. He measures his success by the improvements he can make in his patients' lives. Dr. Dali is married with two children—a boy and a girl; and enjoys cooking, spending time with family and participating in Cub Scouts with his son. Dr. Dali is also affiliated with the Emerald Coast Surgery Center, which was voted the Best Surgery Center in Destin in 2015 and Best Surgery Center on the Emerald Coast in 2016.